(Folk Catholicism) El Tio (The Uncle) is a demon believed to be the "Lord of the Underworld" in Cerro Rico, Potosi, Bolivia. 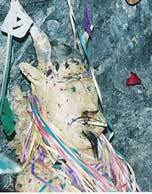 He is a devil-like spirit found in many mines of Cerro Rico that sometimes comes in the figure of a goat. El Tio offers both and at the same time, protection and destruction. The El Tio demon is a male demon.